Zucchini is a favorite vegetable of mine and pasta my favorite starch. Combining the two is a classic pairing, but shaving the zucchini into long ribbons rather than slicing them into the more common round discs, puts a new spin on this old fave. I first encountered this recipe in Bon Appetit years ago, and have since put my signature on it by using homemade spinach fettuccini, adding a bit more heat to the anchovy paste, and mingling in three varieties of mint from my rooftop garden. 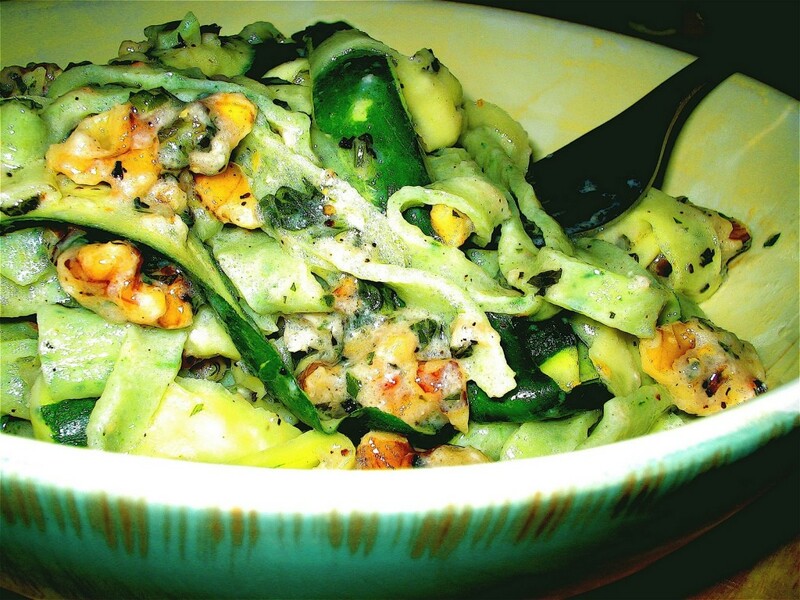 I’ve found that using a green pasta blends beautifully with the ribbons of summer squash; though frankly, if I were watching my carbs or serving a group of gals, I might cut the pasta altogether and let the zucchini take top billing and sing solo. I’m afraid squash blossoms are long gone this time of year and local zucchini is about to go the way of berries and heirloom tomatoes at the farmers market. So today I bid adieu to ribbons of summer squash and look forward to recipes featuring her winter brethren: acorn and butternut. Place 1 zucchini on work surface. Using a vegetable peeler, shave zucchini lengthwise into long ribbons. Discard scraps and repeat with remaining zucchini. Place ribbons (about 10 cups total) in large colander set over a large bowl. Sprinkle with salt and let stand for 30 minutes. Rinse zucchini under cold running water; drain well. Spread on 2 large kitchen towels and roll up to absorb excess water. Set aside. Combine anchovy fillets, garlic, and crushed red pepper in a large serving bowl. Using pestle or wooden spoon, crush mixture until a paste forms. Cook pasta in a large pot of boiling water until al dente. Drain, reserving ½ cup of cooking liquid. Transfer pasta to bowl with garlic mixture. Add oil and ¼ cup reserved liquid; toss. Add zucchini, walnuts, ½ cup of cheese, basil, and mint; toss. Season with salt and pepper, adding more pasta liquid if mixture is dry. Drizzle with additional oil. Sprinkle with squash blossoms. Serve with remaining cheese, a drizzle more oil, and final pinch of salt. While I’m growing zucchini in my Indiana garden, now that I migrated back up North from Flaaahhrida, I first was only growing them for the flowers, so that I can make Fiori di Zucca – flowers stuffed with ricotta and anchovy filling – gently fried in panko flakes. After spending two weeks in Sicily last spring, I have only had homemade pasta, and while it takes a bottle or two of wine to make it, it is just impossible to have dry store pasta now. Last night, we had homemade pasta with an interesting anchovy, butter, garlic and sage sauce. It was obviously very light, and the sage leaves nicely absorbed anchovy flavor (anchovies, however, completely dissolved in butter). Walnuts and mushrooms would have been nice to add to that mixture, just like your recipe above with zucchini, walnuts, basil and mint: I’m gonna have to try this experiment soon! Thanks again for fresh ideas! Svetlana, we speak the same language. I adore Fiori di Zucca…it’s actually one of the dishes I use to describe myself under the portrait on my blog. I just had an incredible version that were spicy and cheesy (a favorite combo of mine, and Mexican cuisine!) at Ubuntu in Yountville, Ca. SOOOOO major! Kimberly! You just gave me three new ideas for a crazy Italian feast we are planning in L.A. this coming weekend… Santa Monica farmer’s market on Saturday – watch out! Cal-Mex brunch is ON.